Only hit 1 sale today, but didn't find anything. I picked these up yesterday through Craigslist. They were left behind by a former tenant at an apartment building, and the super was selling them (along with other random books I wasn't interested in). Asking $30, took $20. The PS2 game and Go were unexpected surprises. Mostly action, but some other random stuff too. There are 89 books. The only one I couldn't translate was the one with the orange flying guys on the cover (near the center of the picture). There were 5 books for that series, and I just couldn't figure out the title. If anyone knows what it is, please let me know. 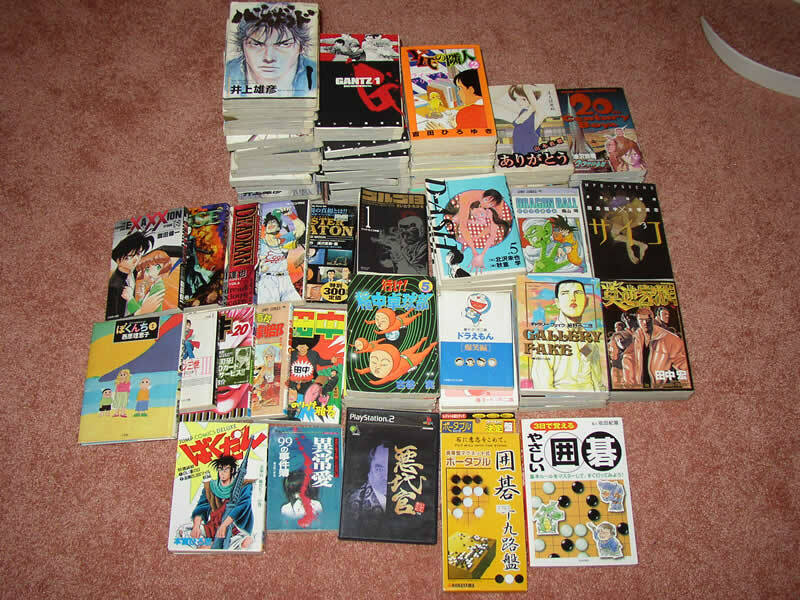 What's cool too is almost all of the books still have their price tags (in Yen!). The books are really nice, a lot of them (including Gantz, Vagabond, MPD Psycho, etc) have dust jackets, which just give them a little some extra. I love the Vagabond covers - the writing is metallic and slightly raised.